I’m a Southern Boy. So I love Southern Food. With all that’s been going on lately, I figured I deserved a treat, so why not whip up some fried chicken? What I like about this classic dish is that it’s one of those which you don’t need a real recipe, per say. You have a set of techniques, of course, but fried chicken is more or less a whole bunch of eyeballing. You can use whatever parts of the chicken you like. You can cut up a whole chicken, or use several of one or two particular parts. It’s entirely up to you. I personally prefer thighs and wings, since they fry quite well and offer the most juiciness. Also, make sure you clean your chicken pieces. Trim off any excess fat, pin feathers, etc. 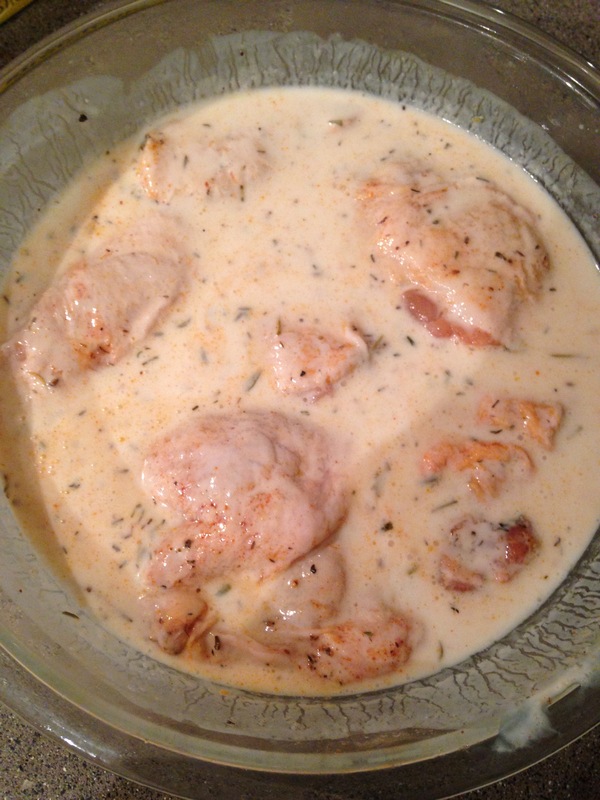 Chicken thighs, marinated in seasonings and buttermilk. Then you season it well and marinate it. Here’s really where frying chicken becomes an imprecise science. You can use as little or as much seasonings as you want and whichever seasonings you want. Now, for the sake of your chicken tasting like something, at the very least use some salt and pepper. But on top of that, do what you want. Today, I used seasoned salt, smoked paprika, cayenne pepper, and herbs of provence. I would’ve used a little bit of garlic powder if I had it. Just use whatever seasonings you have on hand. Toss your chicken to make sure the seasonings are evenly distributed. Then you cover the chicken in some buttermilk and let it soak for about 6 hours to overnight. Soaking the chicken in buttermilk has many functions. For one, the tangy flavor of the buttermilk permeates the chicken plus the buttermilk “carries” the flavor of the seasonings into the chicken. The acids of the buttermilk help tenderize the meat and finally the buttermilk helps make a delicious crispy crust. Then you’ll want to dredge the marinated chicken in some flour, preferably seasoned with salt, pepper, and maybe cayenne pepper, to taste. If you’re a regular shopper at Trader Joe’s, here’s where one of their shopping bags come in handy! Just put the flour, seasonings, and chicken in the bag and shake until well coated. 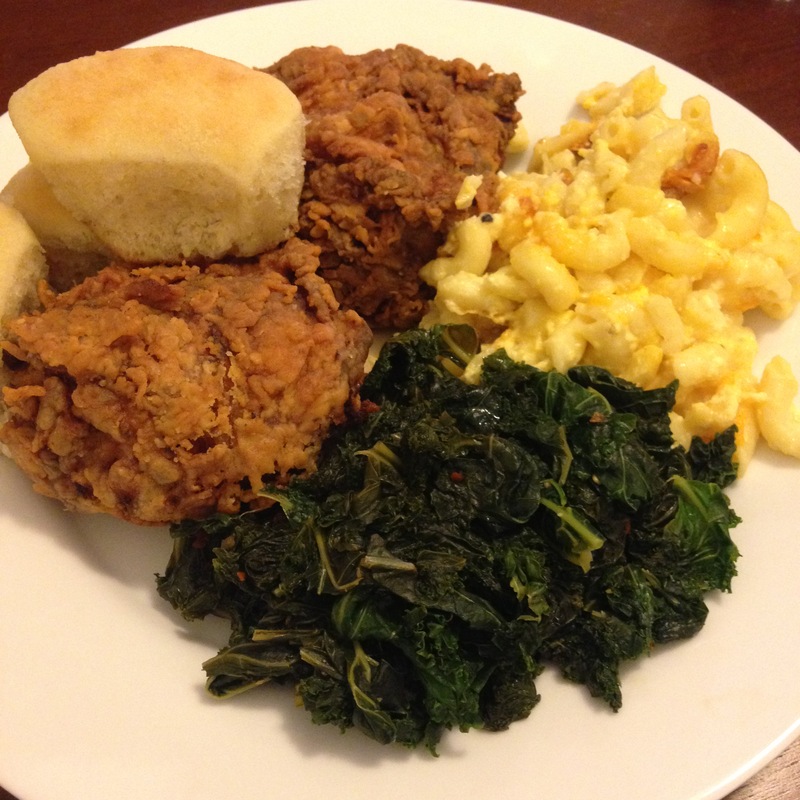 Now, here’s when of frying chicken becomes an exact science: the actual frying part. In particular, you need to make sure your frying oil is the right temperature before you put any chicken in the pot. By the way, notice I said “pot”, not “pan”. I prefer to use a deep and fairly wide pot (perhaps a french oven) instead of a shallower pan. This way, I can cook more chicken at once and also prevent making a huge greasy mess because the pot “walls” form a barrier for splattering oil. You basically want to have your oil in the ballpark of 350 degrees. Now, tonight, I had to eyeball this because my thermometer broke. Testing the oil temperature sans thermometer can easily be done with a wooden spoon, though. You want to set your pot over medium high heat and wait until your oil is the right temp. When you finally put the chicken in, make sure you don’t stuff the chicken in the pot, or the chicken won’t cook properly. Fry in batches, if need be. You’ll want to fry the chicken for about 20-25 minutes per batch, depending on the size of the pieces. Also, sometimes, I’ll stick the fried pieces in a 350-degree oven for 15 minutes to ensure they’re cooked all the way through, particularly if the pieces are fairly large. When the chicken is done, plate it up with your favorite “fixins” and enjoy! Frying chicken doesn’t have to be this daunting experience. If you just get the steps down pat, it’s actually one of the easiest, most delicious things you can cook. Like I said before, it’s a very versatile dish that doesn’t really require a true recipe. You can take these tips, use the spices and seasonings you prefer, and easily come up with your own special way of making it! Give it a try and tell me about how you did it in the comments. I just love fried chicken with mashed potatoes and chicken gravy. I could eat some right now even for breakfast. Your chicken looks perfectly cooked with that great crispy breaded skin. Yum! They turned out very well! Fried Chicken is awesome for breakfast. I would love to make this chicken with some waffles one morning! My mom sometimes serves smothered fried chicken with grits. I’ve even invented my adaptation of Eggs Benedict using fried chicken, biscuits, and sawmill gravy. OMG that sounds amazing! Next time I fry chicken I’m using a deeper sided dutch oven as you suggested, because I really dislike the mess.